July 31st is the 200th anniversary of print journalism in Cleveland, Ohio. While you won't find the Cleaveland Gazette and Commercial Register in newsstands today, it was the first newspaper printed in Cleveland, back in 1818. In celebration of this anniversary and in honor of Cleveland's journalistic tradition, Cleveland's First Newspaper Bicentennial Committee has put together a variety of events, exhibits, and digital productions to be attended, viewed, and enjoyed. The City Club is hosting a forum titled In Print and In Decline: A Crisis For Democracy with NPR media correspondent David Folkenflik. This conversation will look at "the intersection of journalism, free speech, an educated citizenry, and democracy." It will take place at the City Club on July 31st at 12pm. The Cleveland Public Library will hold a reception to kick off its exhibit, When The News Was New, following the City Club forum at 2:30pm in the Main Library, 2nd floor. Containing artifacts and reproductions from the history of journalism in Cleveland over the last 200 years, it will feature contributions from the collections of the Michael Schwartz Library's Special Collections, the Western Reserve Historical Society, the Cleveland Public Library, and local historian John Vacha. The exhibit runs from July 31st to November 30th. Authors, Joan Mazzolini and Dave Davis. 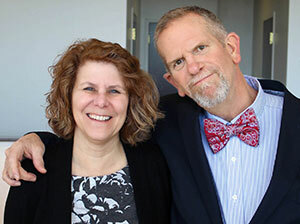 Dave Davis and Joan Mazzolini are releasing their new eBook Plain Dealing: Cleveland Journalists Tell Their Stories . Dave and Joan have collected essays from 25 prominent journalists recounting their careers, the work they did, and the people they encountered along the way. 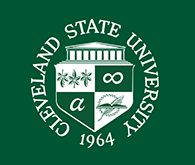 It is a combined effort between the authors, editors, Cleveland Memory Project, and EngagedScholarship@CSU. It can be downloaded from EngagedScholarship@CSU on July 31st. Kent State University MLIS student Michael Skor has completed a new Cleveland Memory Project web exhibit Journalism in Cleveland. In this exhibit he highlights the photojournalists, journalists, columnists, and cartoonists that have made Cleveland's journalism special over the years. The exhibit can be viewed on the Cleveland Memory Project. Permanent link to this topic. Posted 2018-07-26 11:54:23. Reply to Lauren_Felder. Categories: Cleveland Memory, Library News. 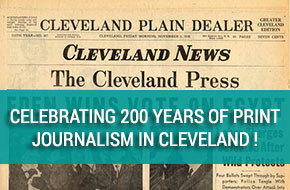 As part of the celebrations on July 31st of the 200th anniversary of Cleveland's first newspaper, Dave Davis and Joan Mazzolini are presenting their new eBook, Plain Dealing: Cleveland journalists tell their stories , in partnership with the CSU Library. 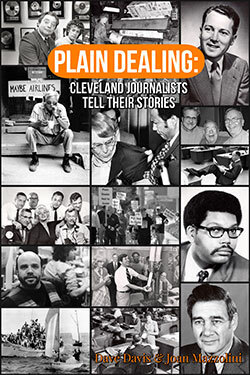 A collection of personal essays by 25 accomplished journalists about their careers, colleagues, newsrooms, the people they covered, and about journalism in Cleveland, Plain Dealing is a joint eBook of the Cleveland Memory Project and the EngagedScholarship program of the Michael Schwartz Library at Cleveland State University. It is being formally launched on the same day as a noon lecture at the City Club and a 2:30 p.m. reception for a new exhibition at the Cleveland Public Library, all coordinated by the Cleveland's First Newspaper Bicentennial Committee. Watch an interview with the authors on WKYC Channel 3. For more information, contact Bill Barrow, at w.barrow@csuohio.edu. Permanent link to this topic. Posted 2018-07-26 10:49:17. Reply to Lauren_Felder. Categories: Cleveland Memory, Library News. On Saturday August 18, 2018, ProQuest will be performing maintenance to maintain currency and security of its platforms. The maintenance is scheduled to begin at 10 PM U.S. Eastern Time and will last for 5-8 hours. Permanent link to this topic. Posted 2018-07-26 09:08:15. Reply to Lauren_Felder. Categories: Library News. You will be unable to search for Library materials using Scholar. You will be unable to request materials from OhioLINK. You will be unable to access the Research Databases from off campus. Permanent link to this topic. Posted 2018-07-19 14:51:36. Reply to Lauren_Felder. Categories: Library News. Showing posts from July 2018 only. Display other dates.